I encourage writers to celebrate their writing milestones. Today my new book Writing New Adult Fiction releases and I’m celebrating with a week of daily “Partial Edit” giveaways and a grand finale “Full Manuscript Edit” giveaway starting Monday. I’ll also share tips for crafting riveting New Adult Fiction, some of the sidebar wisdoms contributed to the book by bestselling NA authors, editors, agents, and cover designers, and other fun stuff like that. Join me for this 5-day virtual book launch August 25-29. And if you’re free, stop by #NAlitchat tonight on Twitter 9pmEST to talk all things NA. 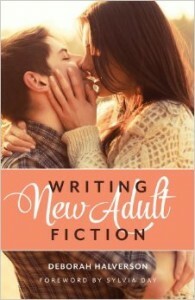 A guide for writers of New Adult fiction, featuring essential information and techniques for creating engaging stories featuring 18- to 25-year-old protagonists against the backdrop of the new adult experience. Includes advice on self-publishing in the NA marketplace and self-marketing. Find insights from best-selling NA authors as well as editors and agents. Oh yay! Got my fingers crossed that you’ll find the book helpful. I sure tried my darnedest to make it so. As for #NALitChat, I can accept back seat to book-turned-movie. 🙂 I just saw The Fault In Our Stars movie on Friday and happily bawled my eyes out – so glad I was in a hotel room and not in a theater. I would’ve been short tissues, big time. How awesome! 🙂 Best of luck, Deborah! Thanks! Always great to hear from you, Kurt. I bought your book at Barnes and Noble on Monday and I love it! Now the pages are covered with my highlighting and side notes which means, of course, I now have to go back and revise my manuscript. Perfect timing, though. I was half way through my second draft. Now I now really now how to go back and make it better! Thank you, Deborah! HIghlighting and side notes? Now there’s my warm fuzzy for the day! So glad to know there are some helpful things in those pages for you. Happy revising! I can’t make the chat tonight (we have visitors) but I look forward to the book launch week! Previous Post Previous post: Re: What Do They Mean, ‘Not Literary Enough’? Next Post Next post: WRITING NEW ADULT FICTION Launch Week, Day 1: NA Fiction v. YA Fiction – What’s the Diff?